"It is not ours to reason why, only to do or die." - Corporal Upham, "The Charge of the Light Brigade"
Between the opening scene and the scene in which it is discovered that Mrs. Ryan of Iowa has lost three of her four sons in June of 1944, is 24 minutes of the most monumental, profound and excruciatingly realistic reenactment of the D-Day attack on Omaha Beach ever put to film. Eschewing a clean, Hollywood look, Spielberg chose the shaky, cinema verité style that hearkens back to the grainy, in-the-action feel of actual war footage, utilizing hand held cameras and film that gives the appearance of the washed out green hue of that era's experimental color film. On the realism of the undertaking, the film's star, Tom Hanks, says "that when the ramp went down [on the Higgins boat] and all I could see was the first three rows of men go down, I realized we were making a very different sort of film than has ever been made before in regards to the gritty detail." It is impossible to ignore that Saving Private Ryan is a Hollywood film, but the difference is in its means. When you think of Spielberg your mind conjures up BIG stories, and films of epic proportion, but really Spielberg's talent lies in his ability to capture the humanity within the story, and to manipulate empathy en masse. While it is true that his is a visual style that is immediately identifiable, Spielberg is in fact a traditionalist, perhaps even a classicalist—if that term may be used in terms of a twentieth century art form—and a master of it. What is evident in Ryan, as with Schindler's List, and that which separates these from the majority of Spielberg's films is maturity. These more "adult" films that depict events of grave importance to our century, are spared the Cecile B. Demille touch, and speak to the heart and soul of its characters. For instance, sound deprivation is not a new technique (among countless others, a great example can be found in the pencil tapping scene from All That Jazz), but Spielberg's use of it in the opening moments of the Omaha Beach invasion are representative of his genius. Here we witness first hand the virtual rebirth of Captain John Miller (Hanks), as he leaves the womb of the Higgins boat, and during the first anxious moments under water and then above ground, as he arrives on the beach and this rebirth of his psyche, there is this slow motion emergence of sound, until he is slapped into the reality of this new existence. 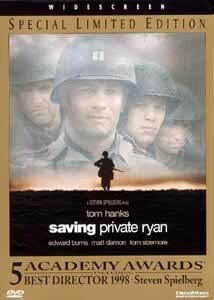 At its heart, Saving Private Ryan is the story of worth, of camaraderie, of limitations and overcoming them at any cost. Despite the fact it includes two of the greatest battle scenes in cinematic history, this is not a movie glorifying war—quite the opposite. Instead this is a human drama that asks the question, is it worth risking the life of many men to save one? It also asks the essential question that every man wants to know: what will I do when I am faced with a life or death situation? Will I run? Will I hide? Will I shake and snivel like a coward? Or will I rise to the occasion? Lead the way? Be Johnny-on-the-spot? A hero? And if I die, will I be remembered? To all those that fought the good war and perished on the beaches of Normandy that June 6th a generation or so ago, Spielberg will make sure that the feats and sacrifices of the many men on that day, as the bard says, "...shall ne'er go by, From this day to the ending of the world, But [they] in it shall be remembered." Image Transfer Review: DreamWorks presents Steven Spielberg's Academy Award®-winning film as an anamorphic transfer in its original 1.85:1 theatrical widescreen presentation. Outside of some pixelation during the opening scene at the memorial, this transfer conveys the original grainy, atmospheric appearance of the theatrical release phenomenally well. There is some evidence of aliasing distortion caused by Toshiba's downconversion to 4:3, but this is not evident when viewed on 16:9 widescreen television. The colors are rich and well saturated, despite the murky greens and browns prevalent throughout the film. Shadow delineation is excellent, and I could find little evidence of edge enhancement. The source print is free of scars and blemishes, and if there was dirt I missed it entirely. Another excellent transfer by the folks at DreamWorks. Audio Transfer Review: The Dolby Surround 2.0 track pales in comparison to the use of discrete channeling in the Dolby Digital 5.1 mix, but it is in my opinion that it may be the best 2.0 mix I have heard yet on DVD. Still, this 5.1 mix will make you dodge for cover as it places you right in the middle of the soundstage. Hunted by bullets and mortar fire, you may not want to watch this DVD without protective gear, the sound placement is that excellent throughout. If this mix has not set a new standard for audio tracks, it is at the minimum at the top of the class. Extras Review: This limited edition single-sided picture disc includes animated menus, full-motion scene access (20 cues), English captions for the deaf and hearing impaired, theatrical and re-release trailers, a genuine cast and crew bios and filmography section which may be the best yet on DVD, production notes capturing the concepts behind the film, a special message from Steven Spielberg for the National D-Day Museum in New Orleans, and a very nice 25 minute behind-the-scenes documentary Into the Breach: The Making of Saving Private Ryan, with interviews of Steven Spielberg, author and historian Stephen Ambrose, Tom Hanks, war veterans, and several others.